With my unique insight into the human mind, health, interpersonal dynamics and principles of business psychology, I help others maximise thier performance and find deeper fulfillment in life. I deliver high-energy, engaging Keynote Speeches and Training on Personal Development, Communication and Leadership. I help people develop high performance thinking patterns, a refreshed sense of purpose, superior motivation levels, effective memory techniques, exceptional people skills and stronger team cohesion. I believe that the greatest of success is built from the inside out; it starts from within - with a mindset for success and a heartset for success. I believe that you’re amazing, that there’s treasure in you, and it’s a joy for me to help you discover this for yourself! In January 2016, just days after I began working in my new Consultant level post in Psychiatry, I opened a global email and stumbled across an open invite to apply for a TEDx talk in Aberdeen. I was excited. It’s hard to explain but I felt it was for me. After I applied and then auditioned, I was fortunate to have landed the closing spot at the conference in February. The conference theme was entitled “Shifting Perspectives” - something I was trained to help patients do so that they could gain more freedom in their mind and, therefore, life. 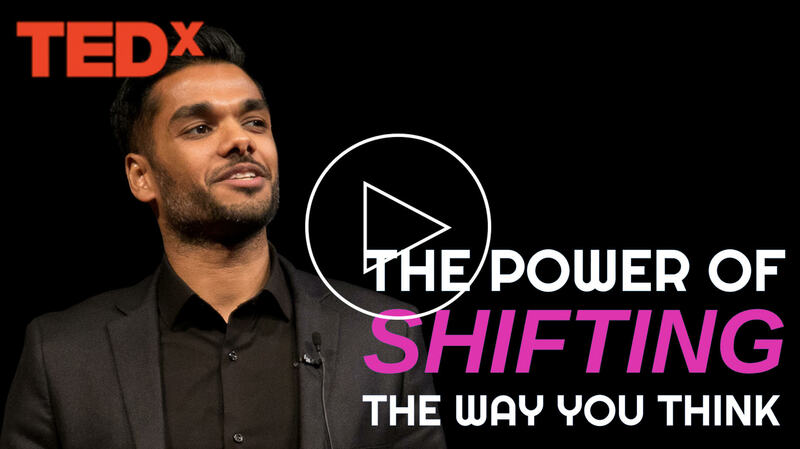 I spoke at TEDx on upgrading our thinking - dreaming bigger and achieving those dreams. Following the talk, businesses and organisations across Aberdeen began to request me to speak at their own conferences, networking meetings, team away days and client events. I did this for free - my focus was all about adding value to the lives of individuals and their organisations. In February 2017, I spoke at a business owner's client event. Some months beforehand, he had asked me if I would speak at it to which I had agreed. But he said, “we must reward you”. That meant I was getting paid and that was a new and foreign concept to me. The speaking that I had been doing to this point, I had done for free. But now it was getting serious. I then decided that I should officialise what I was doing - mainly to be clear to others that this was a distinct venture from my day job as a Clinical Psychiatrist. Since then, Dr Tharaka Ltd Speaking and Training was born and I’ve had the privilege and honour of working nationally and internationally with companies in the FTSE 100, Creative Technology, Healthcare, Banking and Finance, Human Resources, Secondary Schools and Charities. My focus remains as it was at the start - to add value to the lives of others so that they can maximise thier performance and find deeper fulfillment in life. I'm an Aberdonian-Sri Lankan. I was born in 1982, in Leicester, to my Sri Lankan parents who had moved to England because of my father’s postgraduate university education. When I was 5 years old, shortly after my sister was born, the four of us relocated to Aberdeen, Scotland, as my father found work as a University Lecturer in Electrical Engineering. I attended Primary and Secondary School locally. Ever since I can remember, my parents told me that I was going to be a doctor and that I needed to hit the books. I went with the flow and didn’t think differently. Having aced my school exams, mainly motivated by the fear of disappointing my parents, I achieved a position at our local Medical School. I qualified as a Medical Doctor in 2005 and have lived in Aberdeen ever since. I was fortunate to meet my wife, Isla, in Medical School, and we were married in 2005, just after we graduated. We now have 3 lovely, happy kids. During my training as a medical student, I was drawn towards Psychiatry as I felt it was a speciality that gave me time and space to connect with people on a deep level, be compassionate and help them understand themselves. Out of every speciality in Medicine, I just ‘got’ Psychiatry - mainly because I get people. I also became an Undergraduate Educator, teaching Medical Students who were on the path to become doctors themselves. It was here that I discovered my passion for teaching and developing others to further reach their potential. This worked best when I taught in a way that I myself liked to be taught - in an engaging, memorable and fun way! 2013 was a challenging year for me as my sister was ill with cancer and passed away. It was a painful perspective shift that made me more aware of the preciousness of life. Interestingly, it unmasked a hunger in me that I had not known before - a hunger to purposefully live life to the full. To tap my gifts, talents and work from my strengths and passions; to make my life count and to give something of value to others. It motivated me to live from who I really am. In so doing, I began to witness some of the greatest growth in my life. I became more efficient and effective, dreamed bigger and delivered the most positive impact to others than I ever had before. Helping others to 'up their game' and attain greater levels of freedom in their life is my true passion. Following the TEDx in 2016, Dr Tharaka Ltd became one of my vehicles to outwork this passion - to outwork my ‘why’. Fill in the form below if you’d like to commission or collaborate with Dr Tharaka. I am a Psychiatrist and Medical Educator gone Personal Development, Presentation and Leadership Trainer for Business and Education. © Copyright 2019 Dr Thakara. All rights reserved.